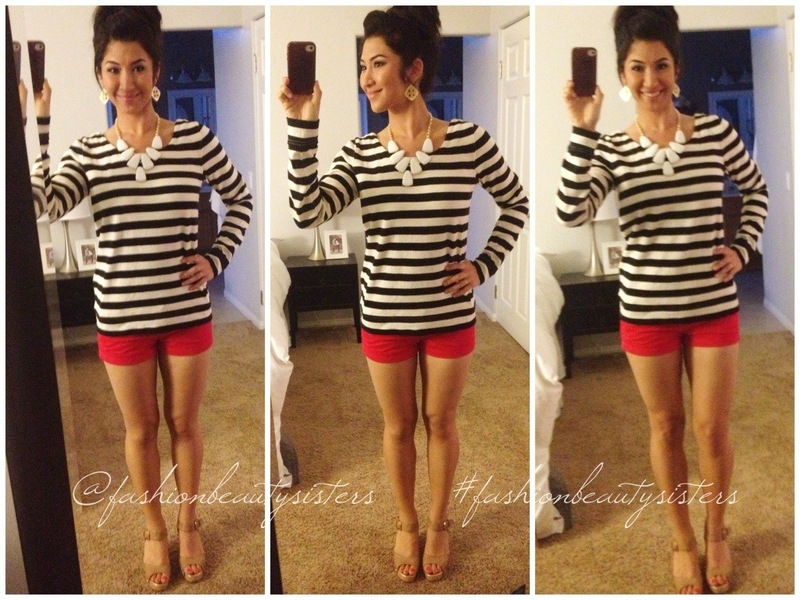 A fun outfit on Pinterest inspired this nautical look. Instead of a short-sleeve tee, I wore a long sleeve, added accessories and did a red short instead of white. My look was for a night out at a tepanyaki restaurant. It was fun, and I enjoyed this outfit! Above: JEWELRY: Kedra Scott, Dawn Medallion Earrings and Harlow Necklace // SHIRT: J Crew // SHORTS: A&F // SHOES: Yvanka Trump. Below is the pin I saw on Pinterest that “Pinspired” this my outfit. I love this look for a casual, vacation day. I will definitely do this outfit with the white shorts during beach season. *Tip on finding J Crew pieces at prices that won’t break the bank: e bay!!! Be sure your item is authentic in order to get the great J Crew quality we all know and love.